Dubai is known as the city of gold - not only does it have the biggest trade of gold in the world, but with it's luxurious seven-star hotels, malls, water sports and golden beaches, not to mention the tallest building in the world the Burj Kalifa, it attracts more than 11 million visitors a year and seems to hold a special kind of magic for those that visit it. However, you don't have to be rich or famous to visit this intriguing city, as there are plenty of activities you can do that won't cost you the earth, or even a penny! Here's a few things that my family and I would love to do, should we have the chance to visit Dubai, that are also budget-friendly. I always love to experience the local life of a place I'm visiting, and seeing a different side to the touristy attractions on offer. Again, you don't have to spend a penny to walk through the markets and take in the sights and smells of the stalls. Al Dhiyafah Road is where locals visit for low-price food and there you can find delicacies from Iran, India and Lebanon, to name a few. I would love to introduce my two to new tastes and smells of such a diverse culture and attempt to adapt their preferences from chicken nuggets and chips. Like most holiday resorts, Dubai has miles and miles of beaches, and not all of them have been adopted by the hotels in the area. Despite being located next to two of the biggest and most expensive hotels in the city, you can still get on this beach without being a guest. For a small charge of 5Dhs (around £1.30), not only can you relax on the white, soft sand, but there are a whole host of things to do to keep you and the children entertained, from a play area to barbecue pits, not to mention plenty of fast-food kiosks and of course sandcastle building! My two absolutely adore the beach and could spend many an hour just digging there, so it's fortunate that this beach has plenty of shady areas for them to sit under. And to be able to jump in sea that isn't the freezing cold temperatures we are used to the the UK would be a novelty! Sitting in the centre of the old city is The Creek, a wide salt-water inlet which divides the old from the new. For just 1Dhs (16p!) you can take a ten minute ride in an Abra, which is a traditional wooden boat, across the creek and get a great view of both sides of Dubai from the water. For a longer experience you can pay 100Ds per hour and the boatmen will take you wherever you want up and down the river and you can sit back, enjoy the cool breeze from the water and soak up the atmosphere. Thinking of these takes me back to the Gondala rides of Venice and whilst I may need to cling on to my boy in case he decides to throw himself in, I think the children would delight in the experience of sailing across the gentle waters and maybe even relish the chance to enjoy some calm for a moment or two. Rather than sitting in the heat and trying to drive through the traffic of the busy city in a pricey cab, the Metro is a fantastic budget-friendly alternative way of getting around the city. You can hop on and off wherever you want, and it stops at various attractions including the Mall and the Stadium. It also offers a view of the city rom an alternative perspective, as it is raised and runs through the various landmarks from higher ground. If we were visiting we would definitely take a ride to the Mall for an air-conditioned wander around, and maybe a purchase or two, before heading to the Wald Wadi Water Park where you can visit after 6pm for half price, when it is much cooler meaning the children are safer running around in the sun and can enjoy the park at a less busy time. Of course a visit to Dubai would be a wasted trip without a visit to the desert. You can book various excursions, from a 4x4 fast-paced experience over the dunes to the sunset trip which includes camel riding and a meal at a Bedouin. However for a more simple and budget-friendly approach why not just pack a picnic and drive to the desert yourself? Take a bodyboard and try sandboarding out, or just let the kids enjoying running and rolling down the dunes whilst you sit back try and take in the majesty of the endless scenery around you. We've put together a short video saying what we would love to do should we be given the chance to visit Dubai ourselves, which you can have a look at below. 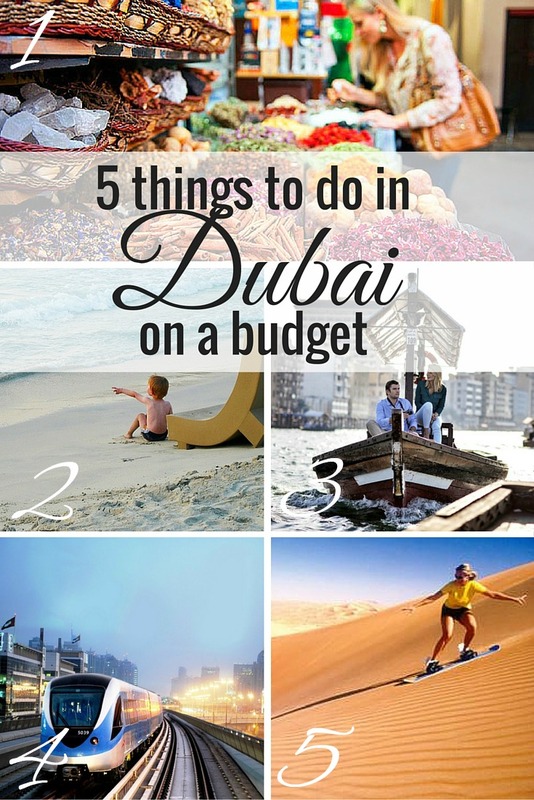 So there are my budget-friendly ideas for a trip to Dubai. I have put together even more ideas on my Pinterest board which you can see here. This is my entry to the Tots100 and Visit Dubai blogger challenge - you can enter yourself and be in with a chance to win a holiday of a lifetime.